While flipping through a Street Rodder magazine from 32 years ago, I was struck by one of their “Garage Scene” features on an Allison V 12 T Bucket that was under construction back then. It’s no secret I’m a big fan of unique T-Buckets. I also grew up in awe of the Allison-powered “Green Monster” dragsters built by the Akron-based Arfons brothers — but that was just through the magazine pages. More pertinent, though, is that I grew up in a town on the Ohio River that hosted Unlimited Hydroplane racing and when those Allison powered hydroplanes were on the river their 1,712 cubic inches of awesome low rpm power could be heard all over town. Of course, you need to know that the Allison V-12 engine was developed and built by General Motors in the late 1930s as a 1,000 horsepower engine to power fighter aircraft like the famous P-40 Warhawks. Over 70,000 Allison V-12s were produced to support our military in World War II and thousands of them landed on the surplus market in the late 1940s. Thanks to the war surplus market, a precision built engine that the U.S. government paid $12,000 for could be purchased for a mere $200 — sometimes less! I just had to know if that wild Allison V 12 T Bucket had ever gotten finished and on the road. I did some research and was excited to find the answer in a really great automotive blog, Tom Strongman’s Auto Ink. Tom Strongman is a journalist and photographer who has covered the automotive industry for more than 25 years as the Contributing Editor for the Kansas City Star. His work also appears in the St. Louis Suburban Journals, the Columbus Dispatch, Universal UClick Syndicate and Home and Away Magazine. After reading Tom’s story about how this awesome Allison V 12 T Bucket had evolved I realized that I didn’t need to do any further research. 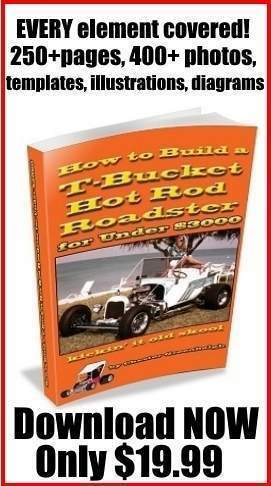 Tom has documented Cliff Hix’s incredible T-Bucket achievement and was kind enough to grant permission to reprint his story, which appeared in 2011, some 27 years after its construction appeared in Street Rodder. So, enjoy Tom’s story and photographs which follow. And when you finish, be sure to check out Tom Strongman’s Auto Ink for more interesting special interest auto stories and a treasure trove of beautiful photographs. Hix explained that when he first got his Allison V 12 T Bucket running, he took it out on the road near his shop alongside the Pittsburg airport. The engine was just idling, and when it seemed as if it might die, he dabbed the throttle. With a sudden roar, the engine spun the 14-inch wide Mickey Thompson tires so quickly that the car shot sideways in the road and nearly pitched Hix into the ditch.